To help you find the perfect short wedding dress we’ve got a round up of this months blog posts for you. From Spring weddings to some top tips on how to style your tea length wedding dress. You’ll find lots of helpful information, so sit back and relaxed and read about what we got up to this month. As the weather really warms up and we welcome spring, sit back and enjoy our round up of the months blog posts. We started the month of March with one of our gorgeous real weddings. 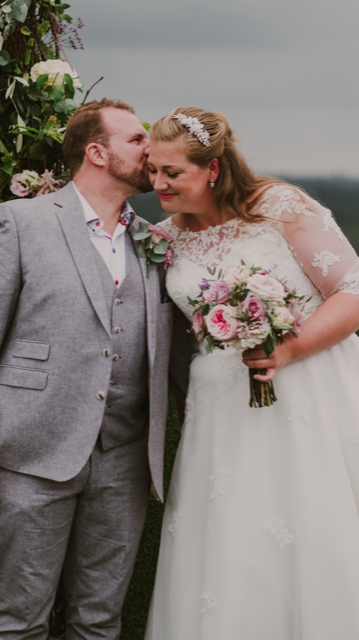 Megan and John married in August and Megan wore Polly by Timeless Chic which is a gorgeous calf length wedding dress. With it’s sweetheart neckline covered in intricate lace, this is a stunning gown. If you are one of our real brides then we’d love to hear from you. It’s a great way for other brides to be to see the different ways to style their chosen tea length wedding dress. We also celebrated the gorgeous spring wedding theme. Giving suggestions of colours, themes and our wonderful tea length wedding dresses. This is Poppy by House of Mooshki and with its pale colour it makes a wonderful choice for a spring wedding. There are lots of things you need to do in the lead up to your wedding day. Chances are you haven’t set foot inside a wedding boutique before so we explain a wedding dress fitting and how to go about your wedding dress search. We have over 150 styles of vintage style wedding dresses in our boutique. This gorgeous dress is Ivy Lace by Timeless Chic. It is one of our High Low range which offers a vintage style wedding dress with a drop hem at the back. Wedding food is a big part of your wedding day so our tips on what to think about will help. Whether you decide to go for buffet or a sit down meal, this will impact your day. Here are some things to think about when deciding what food to serve on your wedding day. There are so many different styles of tea length wedding dresses to choose from. So we’ve put together some great dresses for you. This will help you find the perfect short wedding dress for you. From polka dots to off the shoulder vintage wedding dresses there are so many options. We also show you three beautiful short wedding dresses too. We explored all the details that make up 1950s style wedding dresses and show you. It’s often the things you don’t really notice or realise are there that create the biggest impression. So we put together all the elements that make up a vintage style wedding dress. Have you thought of having a signature scent on your wedding day? Or will you just leave it up to the flowers to scent the day. Your wedding bouquet is an important part of your big day so finding the right one is important. It’s one of the many things to think about, we have put some handy tips together on what suppliers really want you to know. If you are thinking of getting married in a different location, we have short wedding dresses for every occasion. We show you what vintage style wedding dresses go well with your wedding theme. 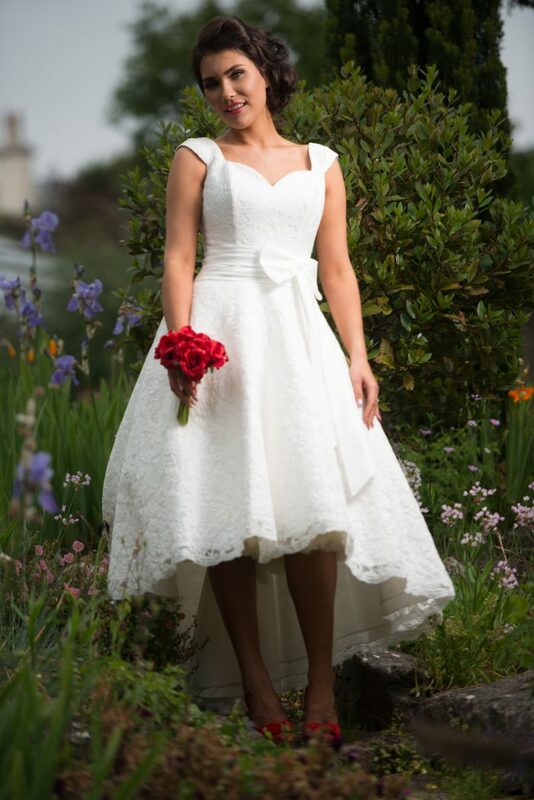 Ultra feminine Molly Mae 1950s vintage style wedding dress by True Bride. It’s a beautiful tea length wedding dress with a 1950s retro edge. Why not book your one to one appointment at our Bexley wedding boutique today. Our expert consultants will be focused totally on your needs and will help find your perfect short wedding dress. With over 150 designs to try, there will be plenty of choice for your big day.